bananas, originally uploaded by c_p_lew. I often hear my landlady talking about me in the morning. In her voice, muffled by the betel mixture that she chews and punctuated by spitting out some of the red saliva, I often hear her talking about my cats, and how diligent I am in putting up with traveling all the time. She usually putters around the garden under my window in the early morning, around 5:30. Around six, the drum and gongs ring for the second time at the Buddhist temple next to my house. That's when Mae Thao gets dressed and goes to the temple. In the meantime, the monks have made their morning rounds and my landlady and other people in the community make their offerings to the monks, chant and then eat together. 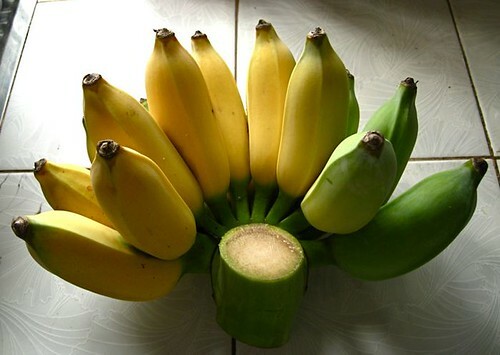 This morning, before I went to work, she gave me this bunch of tree-ripened bananas from a tree in my front yard. The bunch is so freshly cut that you can still see the beads of sap on the stalk. What a nice land lady you have there! We also make offerings to monks in our temple. We call it Dana. Wesak Day is coming real soon - coming Monday. There will be more activities in the temple for us. A Happy Wesak to you!